Earlier this year, the Lake Oswego Ice Creamery and Restaurant began a renovation project that would turn its storefront into a living history project, featuring old photographs from the town's past and vintage memorabilia that really accentuated the old-school diner vibe. The project was a collaboration between General Manager Matt Whipple and Oswego Heritage Council board member Mark Browne, who dug through piles of old photos to find images that spoke to how far downtown Lake Oswego has come since its early days as a company town built around the iron industry. 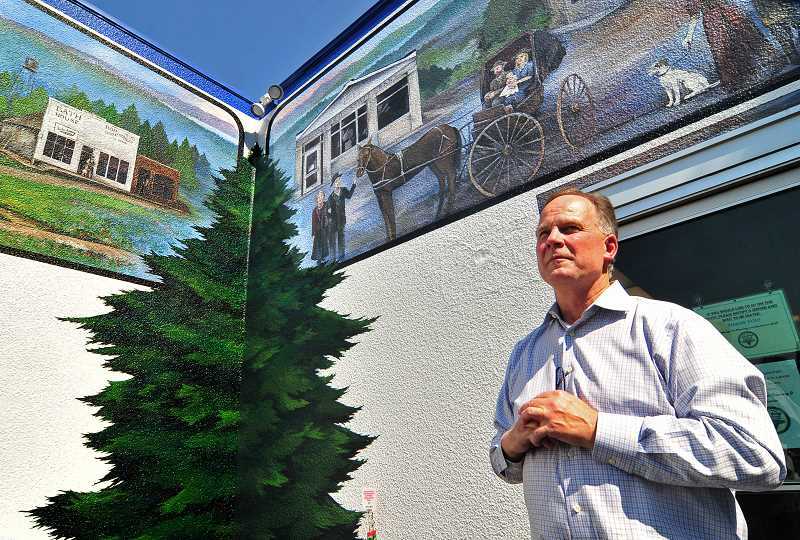 Now the small restaurant on A Avenue is doubling down on its tribute to the town's rich history with the completion of a new outdoor mural depicting the early days of downtown Oswego. 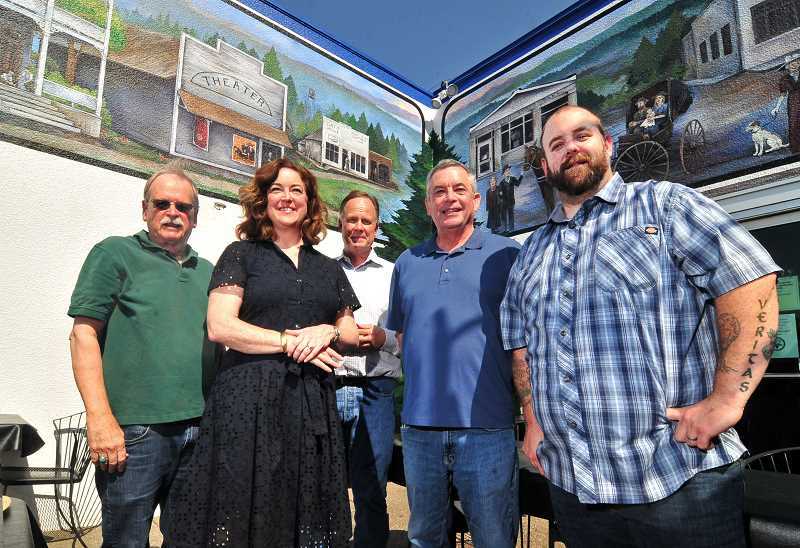 Creamery owner Stan Prentice — working with Browne and the Heritage Council — hired regionally acclaimed artist Allison McClay to create the mural, which includes iconic locations along downtown's main thoroughfare. There's the old City Hall that sat across from Oswego State Bank (the building that houses the Lake Oswego Ice Creamery), the Johnson Hotel and the Oswego Heritage House. "We want to be the vintage diner. We're so much more than ice cream," Prentice says. "We wanted to do this as a way to give back a little bit to the community, because the community has adopted us for so many years. And that's the goal with this mural. You have to know where you've been, where you are and where you're going." Throughout August, pedestrians could catch McClay standing high above the restaurant's courtyard on a piece of scaffolding. She's done several similar murals in North Plains, Banks and for businesses and organizations throughout the Portland metro area. She specializes in these types of murals, she says, because they bring a piece of a town or location's history to life. "My expectations were pretty high, and Allison has beyond exceeded them," Prentice says. "We're doing a lot of fun things, hitting several age groups. When you look at the mural closely, there are little details you might not see at first glance that we're going to tie into our menu. We hope that it starts to create conversation when people come in." Some of those Easter eggs include certain characters that represent current-day figures in Lake Oswego, such as Mayor Kent Studebaker and his wife Kim sitting on the steps of the old City Hall. Prentice's daughters are depicted sitting on the porch of the Johnson Hotel, and when the third part of the mural is finished in a few weeks, you'll be able to find Browne and Oswego Heritage Council Executive Director Nancy Niland among those emblazoned high on the restaurant's outer wall. The artwork also features depictions of Whipple, his wife and young child, as well as a few avid customers who have become close to Whipple and his staff since they started making renovations and revitalizing the business. Whipple believes the history project and new mural are a great way to connect with customers through the story of Oswego without beating them over the head with a textbook. Instead, he says, it gives his employees a chance to start a conversation and build rapport with the people who walk through their lives every day. Over the next few weeks, McClay will be returning to the Lake Oswego Ice Creamery and Restaurant to finish the third and final part of the mural. When she's done, Prentice and Whipple plan to host a small social event and ribbon cutting for the artwork to introduce the community to it's newest piece of public art and historical recognition.